It was whilst studying business and economics at University that Connor Gillivan met his soon-to-be business partner Nathan Hirsch who, at the time, was playing with the idea of creating an Amazon Marketplace business. So Connor’s first entrepreneurial experience when he was asked to be involved a business which bought textbooks off students who no longer needed them and then resold them on Amazon. Over the next three or four years, Connor, Nathan, and the third co-founder built the business up and worked with drop ship suppliers around the US. They created software to make the process of selling their products on Amazon easier and it grew into a big operation with over 500,000 products. His next venture, FreeeUp, was born from the frustration he experienced when hiring freelancers. He has been able to utilize his most loyal customers and has since built a referral program which stands above most others, and is one of their most successful marketing streams. 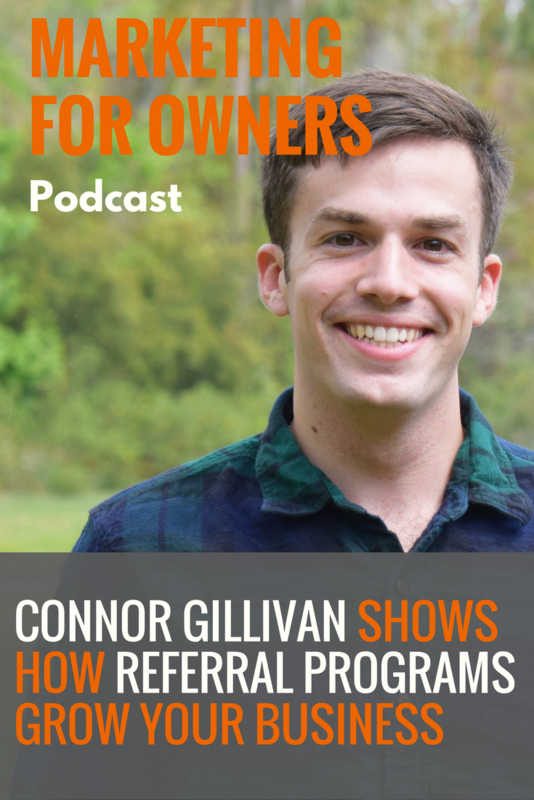 Connor shares with us how he created this referral program, the benefits his business has enjoyed, and how you can grow your business using word of mouth. With a business which used drop shipping, it meant that they didn’t actually have to ever handle any products. Instead, they created relationships with the people who made the products and were able to hold the stock in their own warehouses. They were representing those suppliers on Amazon, and that is what allowed them to increase their inventory to over 500,000 products. However, that brings with it a lot of busy work in ensuring the stock levels are accurate. And these suppliers they were using wouldn’t cut out the middle man and sell on Amazon themselves because of the expertise. Selling on Amazon is a different kind of beast, and Connor’s team knew how to handle it. There are policies and procedures which you have to stay in line with in order to ensure marketplace sellers are providing a high level of customer service and satisfaction. And that’s why suppliers go to companies like his to do it on their behalf, and to capitalize on a sales channel they otherwise weren’t on. The workload obviously meant they had to hire more people, and choose people to work in-house and as remote freelancers. This led to frustrations for Connor and he didn’t like the hire platforms they were using which required a lot of time upfront. With FreeeUp, they allow business owners to work with the top 1% of remote freelancers specializing in e-commerce, digital marketing, and web developer/deign. The referral program is one of the marketing strategies which they identified at the start as being something they felt they could make unique, thanks to the way the business worked. Most offer a percentage or dollar discount for every person signing up through a referral link. At FreeeUp they offer a higher incentive to make their referrers feel more involved and valued. They pay 50¢ for every hour that is billed to anyone they refer, and that continues on forever. That amount is then either taken off the referrers own bill, or paid directly into their bank account. A thing which a lot of business owners overlook when they first get started is not tapping into their most loyal customers. So Connor suggests you should identify the top 10% of users who really love what you do and are going to be your biggest word of mouth source. If you can then get them involved in the process of creating the referral program, they’ll then feel they own it even more and will want to share it out to their communities. They communicate a lot with their clients using Skype at FreeeUp, and have created a group chat for their high-use customers as a communication platform, as well as creating a Facebook group for them all. This is then a great place to bring them all together, share the latest news about the service, and receive feedback. So it’s a good place to start when starting up anything you want your customers’ opinion on. You then want to think about how you can incentivize the loyal customers to share your service with their friends, colleagues, and the wider community. And it should make their life better. This is usually money, in one way or another. Shopify and other software companies like to give you a percentage of the monthly fee they receive from people who sign up thanks to you. In an e-commerce business, you could easily give them a cut of the sale which resulted from you spreading the word. Other ways businesses incentivize referrals is giving people extra for their money, or a discount off of their next purchase. Although FreeeUp didn’t actually end up testing their referral program because it worked right away, they did test the amount which referrers received. Ranging between 25¢ and $1, they figured out the best amount for spurring people on refer people, whilst making it work economically for the business, was 50¢. In the end, it all comes down to using a unique code or link with which to identify the referrer. This is something which most technically-minded can do, but there are also programs, plug-ins, and apps which you can build into your website to do it for you. An affiliate or referral program can be a tricky thing to explain if you go into too much detail. So it makes sense to just keep it simple when it comes to telling people about it, that way it is easier for people to get behind. The content on the referral page of FreeeUp breaks down what someone who signs up might be making, providing a few hypothetical scenarios and examples. Then it breaks the process into four steps for people to sign up and grab their unique tracking URL. To be successful, you have to give them what they need in order to be successful with the program. There are a lot of influencers who succeed with it and therefore enjoy heavily-discounted bills, free use of FreeeUp or money paid directly to them. A majority of people using the program enjoy money off their weekly bill. To spread the message of their program, they utilize the personal calls they make to new customers, as part of their welcome, to inform them of the referral system in place. They also use email campaigns and social media to let people know about the program after they’ve used the FreeeUp servicing themselves. They work the marketing of it into the daily touchpoints which they have with their customers to ensure the message is getting out there and is simple. And the referral program is also available for people who aren’t FreeeUp clients themselves. By doing that they’ve had no negative experiences, but they find that those people often end up signing up themselves after a time to use the services. Referrals can work offline as well as online to allow you to tap into your loyal customers whatever type of business you run. You could produce fliers for your customers to give to their friends, family, colleagues, and neighbors, and offer a discount or free service when people sign up. Hearing about a service from someone you know has a huge impact, especially when compared to people seeing your ad or hearing your sales pitch. That’s because they actually hear about your services first-hand, which that gives them a lot more trust in you. And when you give people an incentive for doing it, they’ll then be more willing to go the extra mile to tell more people about you. Whatever you do, it has to work financially for you. Making an investment in your clients and other people willing to let others know about you, will mean your word of mouth advertising goes to the next level. When they see what they get in return, they’re then more motivated to get you, even more, customers, and that can only be a good thing. To find out more about hiring freelancers to help you out using FreeeUp, visit the website where you can also see details of their referral program. And to learn more about Connor Gillivan and what he does, his personal website is the best place to go. Connor’s book Free Up Your Business, including 50 secrets for bootstrapping million dollar companies is available on Amazon and the FreeeUp website.